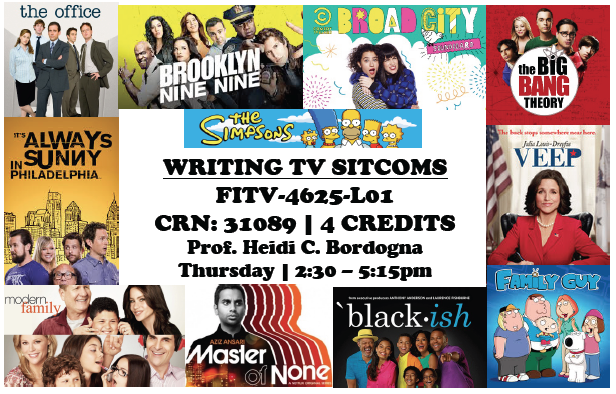 Fall ’16 Course: Writing TV Sitcoms Open for Registration! Laughter always welcome! Claudia Rivera May 3, 2016 May 3, 2016 No Comments on Fall ’16 Course: Writing TV Sitcoms Open for Registration! Laughter always welcome! Are you looking for another course for Fall 2016? How about a class geared to make you laugh out loud and where you’ll learn how to make others laugh, as well? If this sounds like something for you, please join us for the course! Sitcoms are shot by multiple cameras which limit the action to one or two sets. This practically eliminates all action lines in a sitcom screenplay, leaving behind mostly dialogue. This class teaches that behind that wall of sitcom dialogue, sophisticated writers have meticulously developed an invisible scaffolding of comedic tension which requires as much or even more effort than coming up with clever one-liners. This course teaches students to integrate “comedic tension” into all levels of work- from episode premise, to sequence, to scene. TV sitcom writing is performed in teams. Therefore students will write episodes together, and learn skills required to be a comedy staff writer- including originality, creativity, humor and supporting classmates with their scripts. ATTENTION: FALL 2016 CMS COURSES IN DANGER OF CANCELLATION!